My wife and I went out last night. 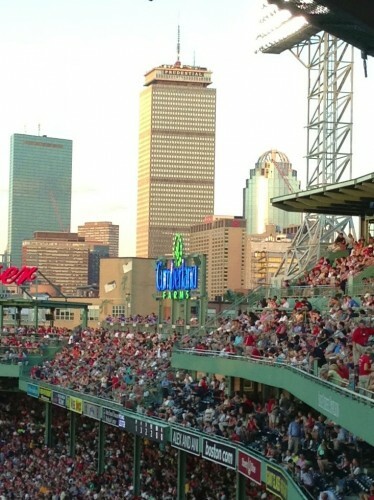 We grabbed sushi and then went to the Red Sox game. It was a beautiful time to hit the ballpark (see above photo). Warm, slight breeze, and already a playoff-vibe among the high-energy crowd, as the Sox and the Rays compete to lead the division. It was such a fun, relaxing and peaceful evening. With a large family and the daily obligations of life, we have a lot going on. So, it’s nice to be able to chill out as a couple and just chat. We spoke about books we’re reading, chatted about the children, and expressed hopes and fears. I’m doing something new in my marriage: rather than hiding my concerns and fears, for fearing of “not being strong,” I’m actually communicating what I feel. In other words, I’m risking being vulnerable. And, I have to say, it has added a new dimension to our marriage. I’ve learned that my wife actually very much wants to hear about what I’m really thinking, and that she doesn’t expect me to be that stoic and emotionless rock of strength. This has led to more deep, meaningful and honest exchanges. So, it was a fun Date Night. Thank you, my bride. I love you!